I heard about this book from my wife. This is not the type of book I would normally read. However, I really enjoyed it and could not put the book down. Michael Tonello’s story held my attention from the first page to the last. What gripped me was the story of how one man constructed his life – moving across the ocean, creating a business, and enjoying life in the process. I have been recommending this book to my friends. 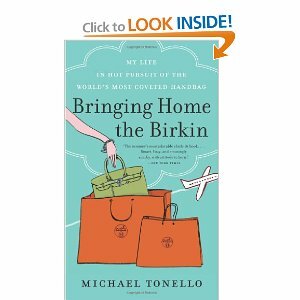 In a funny, whip-smart memoir sure to be a sensation among Vogue and W devotees, erstwhile hair and makeup artist Tonello (now a columnist for HuffingtonPost.com) chronicles a surprising (even to him!) trans-Atlantic move from Provincetown, R.I. to a city he’d fallen in love with on a short trip: Barcelona, where he knows no one and doesn’t speak the language. Tonello’s initial euphoria dissolves when his new job fails to materialize. To stay afloat, Tonello starts selling items on Ebay with startling results: his first, heart-racing success, a year-old $99 Polo scarf he sold for $430 to a Midwesterner (“I guess he really liked plaid”) makes Tonello an instant believer in the resale capabilities of high-end luxury items. Thus his new trade, and his quest for the Birkin, the “it bag” of all time, famous for its impenetrable waiting list (“What do you mean the waiting list is closed? It’s a waiting list. So I can’t wait?”). After many failed attempts, Tonello plans a weekend drive to Madrid in search of the haute couture holy grail; the result is a both a hilarious raid on fashion’s strongholds and a memoir that satisfies like a novel. Fashion die-hards, and many others, will be delighted from beginning to end.